The Altec-Lansing M500 Maestro is a largely lost and forgotten loudspeaker, but it is, perhaps, the best the company ever built. It arrived in the final days of Altec-Lansing, Inc., and production was cut short due to the sale of the company. Why is the M500 Maestro important to us today? It provides the framework for what would have been the replacement for the highly acclaimed Model 19. It has been suggested that the new model would have been called the Model 19MR or Model 19-MR3. So the M500 is of great importance to Altec-Lansing fans around the globe. The M500 brought Altec-Lansing into the world of high power amplification, boasting the ability to handle 250 watts of continuous power, and 500 watts peak. At 250 watts it reaches an ear bleeding 120.5 db. It’s also a rather sensitive speaker, producing 96.5 db with 1 watt at 1 meter. The nominal impedance of the system is 6.8 ohms. The M500 consists of the MR994A Mantaray horn backed by the 909-8A compression driver. For low frequency it utilizes the very impressive model 3154 woofer. The MR994A Mantaray combines the best attributes of the earlier 511 and 811 horns. It can reach down to 500 Hz, while rising all the way to 20 kHz (well… sort of). It’s also extraordinarily smooth across its operational bandwidth. The 909-8A compression driver boasts a frequency response equivalent to the MR994A horn, and produces 108 db at 1 watt/1 meter. It can sustain 80 watts of continuous power when used between 800 Hz and 8 kHz, and 160 watts peak . The Model 3154 woofer is a 15″ with a sensitivity of 95 db at 1 watt/1 meter. It has a useable frequency response from 30 Hz to 2 kHz. In testing we discovered it’s very flat up to 1.3 kHz. It can handle 250 watts of continuous power and 500 peak. The Model 19-MR3 needed to be a three-way design for a couple of reasons. The first being that Constant Directivity horns like the Mantaray require special equalization for high frequency. The other has to do with the ultra-wide dispersion angle of the horn. For the system to have a balanced tonality and good imaging, a smaller and more focused high frequency horn and driver would be required. We tested a wide a variety of horns and drivers in the system and decided that the Eminence ASD1001 driver was the best match. 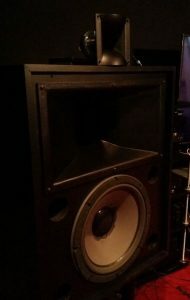 For the horn it came down to the Eminence APT200S and the Dayton Audio H07E. Both had their merits. The Dayton Audio H07E provided both detail and accuracy, which might be great for a recording studio monitor, but a bit too much for long term listening enjoyment. The Eminence APT1001 provided a much richer and more pleasant listening experience with far less fatigue. It also tended to blend better with the big Mantaray horn. Finding a working pair of M500’s proved to be a difficult task. After months of searching we had almost given up, but thanks to the fine folks over at the Altec User’s Board we were able to locate a pair. Unfortunately, they had been suspended from the ceiling of a church and had large threaded rods running through them. We sent them over to Pax Innovation for some needed restoration, and bi-amp binding posts. We also decided to change the drab looking black grills to silver. 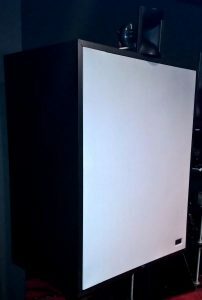 The North Georgia Audio Society isn’t in the speaker design business, but the prospect of completing the illusive Altec-Lansing Model 19-MR3 proved too compelling to resist. It also proved to be more challenging than we could ever have imagined. Perhaps this is the reason why Altec never built the Model 19-MR3. The technology required to make it work was either too expensive, or yet to be invented. After receiving our M500’s back from Pax Innovation we began testing right away. What followed were weeks of what seemed like endless testing and refinements. We had thought that a few slight tweaks to our Model 14 design would be sufficient, but the M500 was not the Model 14, and it had very special requirements in order to be a worthy replacement to the legendary Model 19. It became quickly apparent that no conventional passive crossover would be up to the task. Much like the Model 14, the Model 19-MR3 would require an active digital crossover. This decision was driven by two independent factors: 1. driver time alignment was essential for the MR994A horn to perform correctly, and 2. the MR994A would need to be well controlled to work in the smaller listening environment of most homes. For this task we turned to the dbx DriveRack PA2. Voicing the speaker to the room proved no easier a task. Changes of the toe-in angle as little as 0.5″ made big differences, not only in imaging, but the measurable frequency response. Getting it right took days of testing and adjusting the PEQ for room correction. Most of what we say must be confined to the realm of subjectivity. Fans of the original Model 19 might object to some of our thoughts on the new MR3, but there are certain facts that are indisputable. The Model 19-MR3 has significantly better power handling than the original. The MR994A horn performs closer to the ideal mid-range (300 Hz – 3 kHz) by being able to cover anything from 500 Hz to 13 kHz. It also is not subject to beaming. High frequencies above 13 kHz are virtually flat all the way out to 20 kHz due to the MR3 being a three-way design. Through the use of a smaller high frequency horn overall system imaging is greatly improved. The original Altec Model 19 is, however, far easier to setup. The Model 19-MR3 is not a good choice for the casual hobbyist, and is best left to those who are comfortable with crossover design and system setup. In our subjective listening tests the Model 19-MR3 was favored by every member of the club over the original 19. It’s sound-stage was similar to that of an Altec 511 (big and bold). It’s imaging was three-dimensional. Live recordings were life-like in almost every detail. It was the only system we have ever tested that didn’t improve dramatically with the addition of a subwoofer. The 3154 Altec woofer is excellent in every respect. The Model 19-MR3 proved to be one of the best Home Theater speakers we’ve ever tested. It was easily the equal of the JBL Synthesis, and at a far lower cost. In Part 2 of this series we’ll cover crossover, time-alignment, and system voicing for the Model 19-MR3. As always, your comments are welcome. Head on over to the Great Plains Audio Community now!